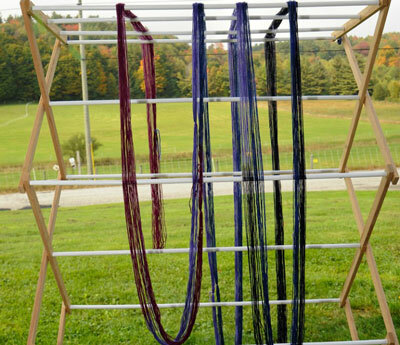 Now that you have dyed the skein all that is left to do is to steam and wind the skein. 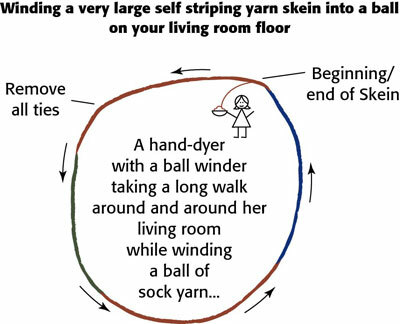 Then you can use your yarn to knit socks and watch your self-striping pattern emerge. When you knit the second sock, be sure to start at the same end of the second ball of yarn (with the same color that started the first sock). When you are finished, you will have a perfectly matched pair of socks. 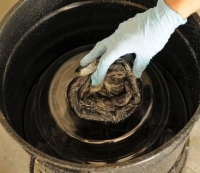 1When all sections are painted and wrapped, fold the skein onto itself, roll it to form a coil, and place it in the pot to steam. After 45 minutes, allow the skeins to cool inside the pot. 2Working section by section, unwrap the plastic. Be sure to allow the yarn to cool completely. 3Make a warm rinse bath, adding 1⁄2 teaspoon Synthrapol to the water. Submerge the skein and swish gently. This rinse removes all traces of thickener. Rinse again in a clear warm bath. 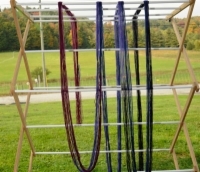 Spin out excess water and drape the skein over a rack or towel bar to dry. 4Spread the skein out on the floor in a large oval. Carefully snip all the choke ties. Leave the two ties that divide the skein into two 200-yard (182.3m) skeins. 5Holding a ball winder in your hand, snip the first tie and thread the end of the skein onto the winder. 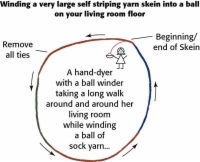 Walking in a circle, slowly reel the yarn onto the ball winder. Continue to walk around the circumference of the skein, reeling as you go, until you reach the tie that indicates you have wound half the skein (200 yards) into a ball. 6When you reach this second tie, stop winding and remove the first ball from the winder. Cut the tie and thread the end of the second half of the skein and begin winding as you did for the first half of the skein. When finished, you will have two nearly identical 200-yard (182.3m) balls. Each ball of yarn is enough to knit a sock.